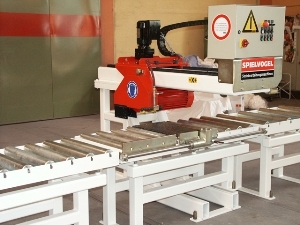 The Spielvogel is a robust cross cut stone saw. This is an ideal machine for a stone masons workshop or indeed the larger producer who wishes to manufacture paving slabs or Ashlar. The cross cut saw has either a galvanized frame or standard paint specification. Pieces of stone are placed on the rollers in order to progress towards the cutting area of the saw. 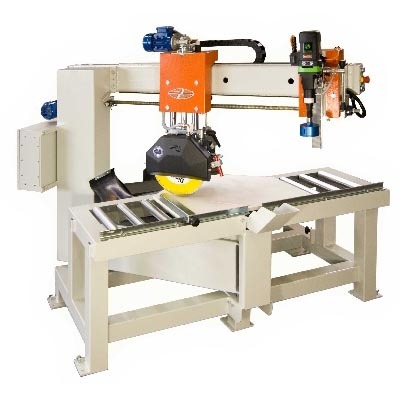 The machine is available with manual or semi-automatic motor cutting feed. 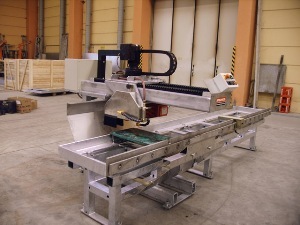 Furthermore it can be equipped with a tilting device for miter cuts or a rotating device for diagonal cuts. 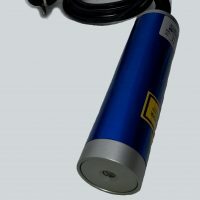 A clever innovation ensures the blade travel speed slows down in order to avoid bursting out the corners of the stone.